Can you remember a time when the mainstream UK media followed American mid-term elections with such fervour? Recently, we seem to have been lambasted with every possible twist and turn both before and after these elections. Of course, it all comes down to one man – Donald Trump. These mid-terms are widely regarded as a referendum on Trump and, are estimated to be the most expensive election of their type in history with expenditure reportedly reaching $7.2 billion, dwarfing the previous record of $4.2 billion. They are certainly the most fractious that we can recall. The US mid-terms are conducted during the second year (or ‘mid’ way through) a president’s 4 year ‘term’. The vote is used to elect congressmen and senators to the House of Representatives (House) and the Senate respectively. The amalgam of these two entities form Congress, which equates to our parliament, and is used to pass legislation or policies. What happened in Tuesday’s election? Prior to Tuesday’s vote, both chambers were controlled by Republicans thus making it easier for Tump to impose his political agenda. Numerically, the House has 435 seats available; 240 controlled by Republicans and 195 controlled by Democrats. In the 100 seat Senate, 51 seats were held by Republicans whilst Democrats held 49. Tuesday’s vote has now changed the balance of power. Republicans have retained control of the Senate, with a slight extended lead, but they have lost control of the House. Democrats now control 225 seats in the House, with Republicans only having 197 seats. This means congress is in ‘Grid-lock’. What could the ramifications of ‘grid-lock’ in Congress be? Whilst grid-lock in the government may sound severe, there has been a lot of evidence to suggest it is in fact generally beneficial in several ways. For example, Ken Fisher, an investment historian and reporter for the FT, describes an extraordinary tendency for stock prices to rise in the fourth quarter following a mid-term election. This effect, he says, continues for two consecutive quarters. The effect described happened during Obama’s last mid-term. Mr Fisher suggests this is now likely to be the case. One obvious question is why would political gridlock be good for wealth creation? It is thought that a divided Congress tends to agree only on issues that command strong bi-partisan support. Broad agreement to get things done is translated as being beneficial for investors. Historic data shows that stock returns during the first two years of a presidency tend to be weaker than the latter two. The impact during the election month of November has also been measured. On average, the monthly return during a mid-term is 1.91% versus 0.29% in the month of November when it coincides with a presidential election year. The average return during November, year on year, is 1.11%. In the grand scale of things, the differential is not hugely meaningful. However, what is interesting is that since 1939 the third year of a US president’s term has never resulted in negative returns in the US stock market. Although the pace of growth in the US may begin to slow as the effects of the fiscal stimulus wear off, historic evidence suggests the mid-term results of gridlock are not normally negative for the economy. If the positive effect on the stock market holds true one could argue that this will mitigate fears of an economic slowdown. At times the stock market can operate as both cause and effect. In other words, a stronger stock market may prolong the economic upturn. Whilst President Xi of China and President Trump of the US go toe to toe on trade, the financial landscape in China is undergoing fundamental structural change. Reports about increasing levels of debt in China have been worrying economy watchers. 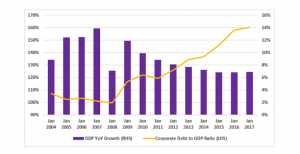 Burgeoning debt within the corporate sector has been under increasing scrutiny. It heralds vulnerabilities associated with borrowing. The corporate sector is especially susceptible during slowdowns. As a command economy it is not surprising that the corporate sector has been used by the Chinese authorities as a conduit for stimulating growth, particularly in relation to infrastructure. This approach involves taking on more debt. In China the corporate sector is dominated by State Owned Enterprises (SOE’s). SOE’s are able to accommodate large scale capital investment programmes, funded by borrowing, and being centrally directed, banks’ lending to them are not inclined to dictate what represents too much borrowing. Today, the country’s corporate debt to GDP ratio (illustrated below) currently sits at a staggering 160%, with debt levels rising sharply since December 2008. Thankfully, memories of the financial crisis are still strong in the minds of central banks, including the Peoples Bank of China (PBoC), which is the Chinese central bank. As shown by our chart, the financial crisis, which began in 2007, caused China’s YoY GDP to fall from 13.9% to 7.1% in 2008, a dramatic event. Growth subsequently recovered but China’s rate of growth has been slowing. This is a function of the economy maturing from ‘developing’ to ‘developed’ status. Reflecting on slowing growth and a new plan, the Chinese authorities are now guiding policy on lending differently. They want to make sure elevated debt levels do not trigger the next systemic economic crisis. Their key aim right now is not the level and amount of debt held by SOE’s, but tackling debt which has grown uncontrollably through clever financial engineering. This lies elsewhere and has emerged through what is known as the shadow banking sector. Shadow banking is when financial intermediaries operate without regulatory oversight, unlike ordinary banks which must follow set criteria. The details behind shadow banking are complex to explain but the result is not difficult to understand. By using complex arrangements, a loan of 100RMB from a financial intermediary operating in the shadows can create a 400RMB liability trail. Multiplying by a factor of 4, excess levels of debt within an economy can take hold quickly. The Chinese authorities know that consequences arise from amassing debt. They do not want to repeat the painful events of the 2008 financial crisis hence they are now acting with due care. If left unregulated, the shadow sector represents a ticking time bomb for the Chinese economy. The precondition for this to happen is typically slower growth. This causes default rates to increase and it can be the beginning of a downward spiral. However, the PBoC is not looking to cut the overall debt to GDP ratio just yet. They understand the role that debt can play within economic expansion and the main issue right now is where the debt is situated. We have pointed out on several occasions that China is on a path of transition. It is looking to change from a manufacturing led economy to one with a greater services component. Debt, used properly, has the power to drive growth and bring about change. However, if left to expand uncontrollably, and without oversight by the central authorities, it also has the power explode. Being careful now will be like letting air out of a balloon before it pops.